In recent years, climate change, water shortages and international discussions about sustainable and environmentally friendly actions have forced us to rethink our way of working within the wine industry. 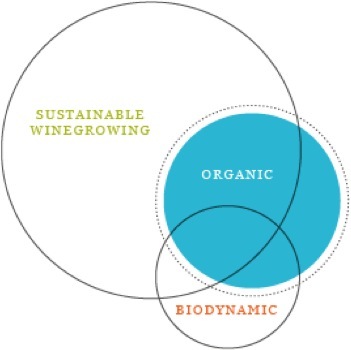 There’s organic wine, biodynamic wine, and sustainable wine but what’s the difference between all of these seemingly similar terms? Certified organic food is grown or produced without harmful or toxic pesticides, sewage sludge, petroleum-based synthetic fertilizers, genetically modified organisms (GMOs), bioengineering or ionizing radiation. With respect to wine specifically, there are two types of organic listings on wine bottles. Wines can be made from certified organically-grown grapes, avoiding any synthetic additives, or, to take it a step further, “organic” wines are made from organically grown grapes, and are also made without any added sulfites (though naturally occurring sulfites will still be present). However, the US and Europe have different definitions of what constitutes organic wine. In the US, wines labeled organic cannot have added sulfites to prolong shelf life; they must be certified to contain no more than 10 parts per million (and only naturally occurring sulfites at that). In Europe, wines can contain some additional (non-naturally occurring) sulfites and still be labeled organic. Biodynamic farming is similar to organic farming in that both take place without chemicals, but biodynamic farming incorporates ideas about a vineyard as an ecosystem, and also accounts for factors such as astrological influences and lunar cycles. In biodynamic farming, the core principle revolves around the farm as a living organism. Many people say biodynamic farming is organic farming taken to a higher, holistic level. But biodynamic farming actually came first. One difference between a certified biodynamic farm and a certified organic farm is that the entire farm must be biodynamic to become certified by Demeter, t oversees biodynamic farming. The entire farm does not need to be organic for a particular crop to be certified organic. Biodynamic wine specialists believe that there’s a lot more to growing organic grapes than simply refraining from the use of pesticides. 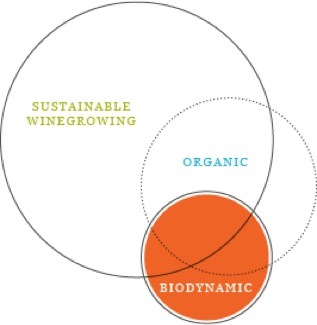 You see, biodynamic farmers treat the vineyard as a closed loop, employing organic practices and natural alternatives for eliminating waste and promoting a healthy ecosystem. “Sustainable” is the hardest of the three terms to define, because there is no legal definition, or government certification program for sustainably-produced food. Some third-party agencies offer sustainability certifications, and many regional wine industry associations have developed clear standards, where compliance is assured by rigorous, independent audits. However, the two other approaches — organic and biodynamic — neglect two essential components of sustainability:  the human factor — workers, neighbors and  the profitability of all measures taken. Along with environmental protection, these two measures form the triangle of sustainability the triple bottom line of environment, economics and social responsibility. Sustainability in agriculture involves everything you do on the farm. This includes economics, environmental impacts of everything done on the farm and all aspects of human resources, including not only the farmer and her family but their employees and the surrounding community. 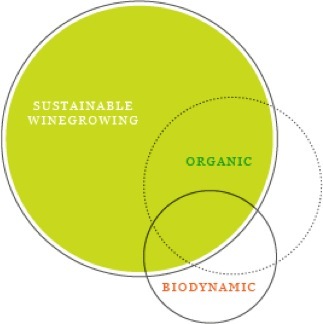 Sustainable wine production is a system that employs the soil’s fertility as base, taking care of the environment. Another aim is to reduce GHG emissions as the product moves toward the marketplace, and all the while ensuring some level of profitability. In a way, a commitment to certified sustainability is the most demanding of all three types of agriculture. This journal entry was the second in a series on sustainability in the wine industry. Check back often, as I’ll continue to share insights on sustainable wines and how consumers can become more aware of this “green” trend in wine. I’ll also introduce some high quality and great tasting wines that are sustainably produced and share the stories of the winemakers’ commitment to these growing practices.